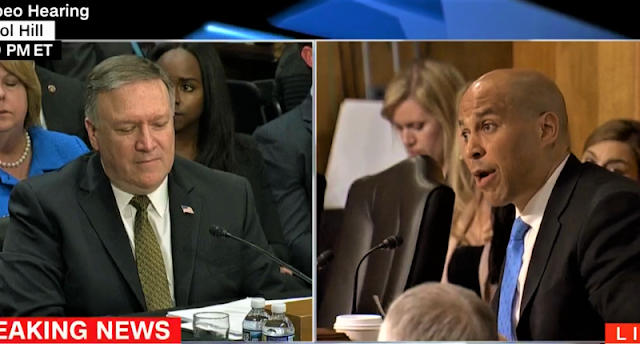 Sen. Cory Booker (D-NJ) (at right) interviews Secretary of State nominee Mike Pompeo (Screen cap). Booker was referring to a 2015 rally in Georgia where Pompeo quoted a Christian religious leader who decried Americans as having “worshipped other gods and called it multiculturalism and…endorsed perversion and called it an ‘alternative lifestyle'”. See full story here. Video of the exchange on whether being gay is a perversion is from CNN below.